Faithful readers of this column may know that I was the Last Online Mac Pundit to publicly advocate for a one-button mouse. I wrote several articles about it, as a matter of fact, until just recently, when I officially gave up the ghost and became the Last Online Mac Pundit to Surrender and Declare His Support for the Two Button Mouse. For example, see Two-Fingered Trackpad Scrolling Could Give Apple an Excuse to Build a Two-Button Mouse, where I say, "They wouldn't be surrendering their design principles; they'd be using them to promote a better, simpler, more functional mouse with fewer moving parts than anything else on the market." I had no idea I had such influence in Cupertino! I feel kind of like Jon Stewart did when he interviewed Colin Powell. Stewart asked Powell whether or not "W" knew of the Daily Show"
Stewart: "Does he know I exist?" I'd like to ask someone at Apple if Jobs knows I exist, just to be able to do a Shaternesque "Noooooooo!" when the answer turns out to be no. Anyway, this little missive is about mice, right, and the scroll ball, touch sensitive two buttons that aren't two buttons, and the pistol-grip pressure sensitive switches. As is the case with all pundits, when we finally get what we want we have to point out all the flaws in it. That's just what we do (it's in the job description). Not that I actually have the new mouse to play with, but I'd certainly write a more cogent review if one of them came across my door (hint, hint). Okay, so here goes: How easy is it to clean crap out of the scroll ball compartment? It doesn't look like it would be easily removable. Next: How sensitive are the pressure switches? Are you going to be setting them off all the time? Also: Is there a wireless version? Finally: How long (or short) is the cord? Apple used to ship these ludicrously short cords with the old Blue & White G3 towers. 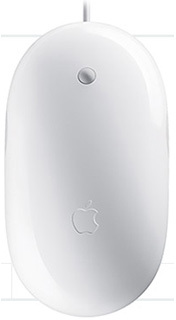 Now that I've considered all of that, let me be the first (and probably only) advocate on the Web to recommend that Apple switch back to the old one-button mouse. Sorry folks, it's an ugly job, but someone's gotta do it.